As temperatures fall outside it is great to have a tropical escape and for us it is our Warm Asia section. This post will be readily available in our Orchid Culture tab along with our advice on growing Cool Asian Orchids, watering and temperatures. 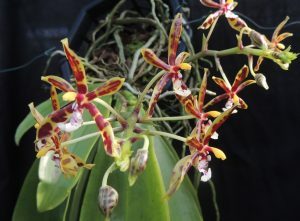 look out for articles coming soon on warm and cool orchids from the Americas. 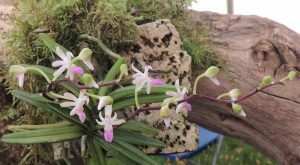 Growing Warm Asian Orchid Species at WrithlingtonThis article is the second in a series in which my students and I will share our observations and cultural principles for a group of our favourite orchids. In this article we will take you into the warmest section in the Writhlington Glasshouses – Warm Asia.We have visited three areas in Asia on our school expeditions, Sikkim, Arunachal Pradesh/Assam and Laos. In addition we have a new project working with the Sarawak Orchid Society and hope to work with Schools in Sarawak later this year. We will start with a look at the warm growing orchids of the Himalayas before moving on to Laos. The Himalayas rise abruptly from the Northern Plains of India, formed from the great rivers of the Ganges, Indus and Brahmaputra, and a visitor driving into the Sikkim from West Bengal, or into Arunachal Pradesh from Assam starts at around 100m above sea level and ascends first through semi-deciduous Sal Forest (the dominant tree species being Sal tree or Shorea robusta) into a more mixed forest with more evergreen trees. 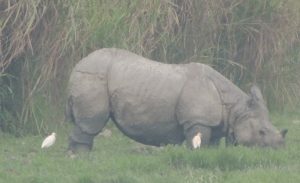 This forested band is virtually continuous for thousands of miles across North East India, includes a number of significant reserves, and provides a home for Tigers, Elephant and in the wet areas Rhino. 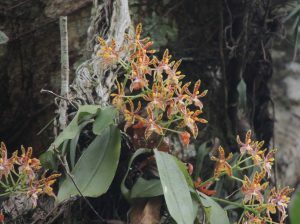 It is also home to some charismatic orchid species. In our experience visiting this habitat is straightforward and rewarding with many orchids growing along main roads and more within the designated reserves. 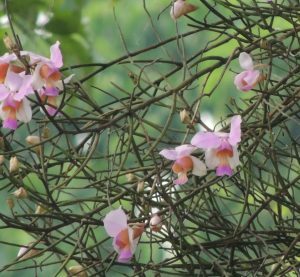 Let’s start with a look at the orchids on the forests along the Brahmaputra in Assam. 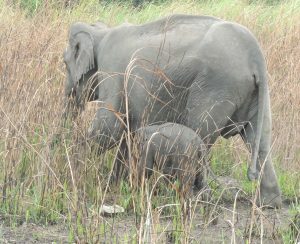 Kaziranga National Park is well known as home to the World’s largest population of Indian One Horned Rhino. We have seen these wonderful animals both inside and outside the reserve and they are often accompanied by deer and wild pigs. (we guess that the smaller animals know that tigers are hiding in the long grass and the only protection is to stand next to Rhino). Kaziranga and the forests around are also home to some great orchids. Papilionanthe teres is particularly abundant growing in full sun in the tops of tall trees. In more shaded spots we found Aerides odorata which is a species we do very well with at Writhlington. Another species that clearly appreciates shade is Phalaenopsis mannii which we found growing in a large evergreen tree and hanging from the lowest branches. The roads leading into Sikkim and Arunachal Pradesh also have a number of warm growing deciduous dendrobium species. 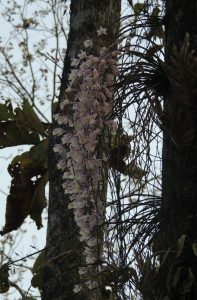 The most abundant in Sikkim is Dendrobium aphyllum while in Arunachal Pradesh it is replaced by Dendrobium transparens. Other species include Dendrobium fimbriatum, Dendrobium crepidatum and a little higher and cooler the dramatic Dendrobium densiflorum. 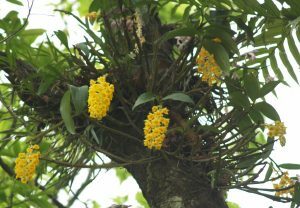 Vandaceous orchids are abundant in the lowland forests of Sikkim especially Vanda ampullacea which often grows alongside Dendrobium aphyllum, together with Vanda pumila and Aerides multiflora, Rhynchostylis retusa, Ludisia trichorrhiza and Acampe rigida. In Laos we have spent time exploring the hills near to the Mekong river and up onto the Bolaven Plateau at around 1000m. 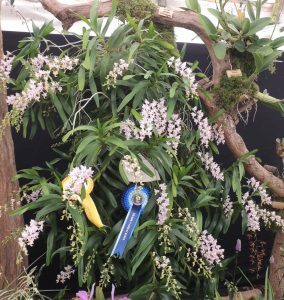 A great diversity of warm growing orchids included Vanda denisoniana, Dendrobium thyrsiflorum, Dendrobium chrysotoxum, Coelogyne trinervis and letiginosa, and the small growing Cleisostoma teretifolium amongst others. The forests in Laos are mixed with evergreen and semi-deciduous trees and a similar seasonal weather pattern to the himalayan lowland forests with wet summers and a dry cooler winter though in total rainfall the Himalayas are wetter. Near the Mekong temperatures vary from a winter range around 17C-32 to a summer range of 23-35C with an annual 2m of rainfall and at 1000m temperatures are from 11-23C in winter to 17-28C in the summer with 4m of rainfall. In Sikkim’s warm lowland valleys, temperatures 300m above sea level vary from a 11C-23C winter range to a summer range of 23-32C with 3m of rainfall. It is clear from this data that our ‘warm forests’ in Laos and India are not that warm in the winter! In comparison the climate of lowland tropical habitats near the equator such as in Sarawak are constantly warm without a winter difference. In Kuching, Sarawak, lowland temperatures are constant throughout the year and vary from a minimum of 23C to a maximum of 32C. This data indicates that a number of different ‘warm growing’ orchid houses are needed to reflect the impact of latitude and altitude. So what should a grower do? In the UK I have visited a number of rainforest attractions that maintain a minimum temperature throughout the year of 23C reflecting the climate of lowland tropical habitats near the equator but we feel that this is far from ideal. Firstly we want to grow orchids that do experience a seasonal difference, secondly we find that the majority of our target orchids grow somewhere in the 300-1200m altitude range, and thirdly the heating cost (and environmental impact) of maintaining a greenhouse at 23C is a not something we want to pay for. In our warm Asia section we maintain a nominal minimum temperature of 18C. 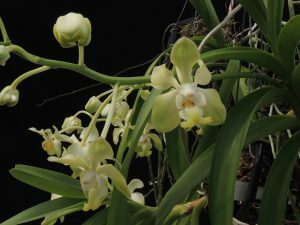 We find that this suits almost all warm growing species although there are some determinedly hot growing species (Vanda sanderiana and Dendrobium lasianthera come to mind) that have failed for us. Within the greenhouse, of course, we do have options when it comes to temperature. 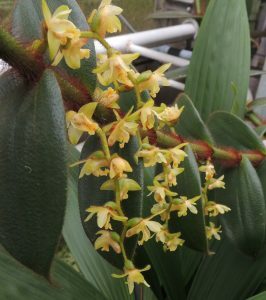 We find that Grammatophyllum scriptum, a coastal species from the Philippines, finds the temperatures a bit low in winter and we have had leaf spotting as a result. We now grow this species hanging right in the top of the greenhouse where convection (hot air rises) will ensure it always has the highest temperature available. For many of our Himalayan warm growing species a winter of 17C is actually too high and so they have a ‘holiday’ elsewhere in the school glasshouses (min 10C in Cool Asia or min 12C in Cool Americas). There are plenty of other species though that from natural habitat data would probably enjoy warmer winters but manage perfectly well at 18C for us. The Warm Asia section has a lot of microhabitats in terms of light and temperature and we make full use of these. We grow plants mounted, in baskets and in pots so let’s look at some of our plants. 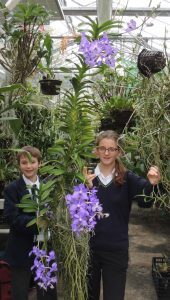 Starting with the largest we are particularly proud of our plants of Aerides odorata, Trichotosia ferox and Vanda coerulea. The former grows from a wire hanging basket hung from the roof and last summer had 60 spikes of flowers each with 10 to 20 flowers and the most intoxicating fragrance of lemon sherbert. The plant arrived in 1997 as a single growth seedling and grew as one stem until moving into our current greenhouses in 2008 from which point it has become multi stemmed and a wonderful specimen 2m high (although of course it grows downwards) and 2m wide. Our biggest challenge these days is getting it in and out of the greenhouse for shows. Our conditions closely reflect those of the plants we have seen in Assam and not surprisingly the plant is very much at home. Trichotosia ferox is an intriguing species from Borneo and Peninsula Malaysia that is hairy in every way – hairy stems, hairy leaves and hairy flowers. It grows exceptionally long, eventually pendulous, stems that keep growing for at least five years and our longest stems are more than 3m long. The flowers are produced in sprays all along the previous year’s growth on all stems simultaneously and look amazing. We manage the extreme growth habit by growing the plant in a basket wired to the top of a metal tower. The species grows in forests above 800m and so suits our requirements of warm growing but not that warm. Vanda coerulea is often listed as a cool growing species as it is native to forests from Assam to Thailand from 800m-1700m. This is 600m higher up than the Aerides we have seen in Assam but selective breeding has targeted both the larger rounder flowers seen in cultivated plants and warmth tolerance to suit cultivation alongside other members of the genus. Our largest specimen now multi stemmed and 2m high certainly enjoys our version of warm conditions. Alongside our large plants we grow a number of miniature Asian species. Most of these we grow mounted to show of the natural growth habit and again we identify microhabitats to suit. Lots of our miniatures live on a vertical weld mesh frame. There are three gradients on the frame as plants higher up get increased light, higher temperatures and less water. 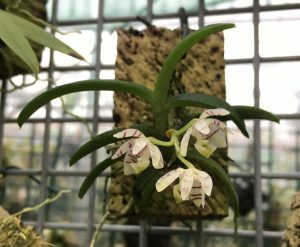 Examples of species that enjoy the warmer and dryer conditions at the top of the mesh are Schoenorchis fragrans and Stereochilus dalatensis form the Himalayas and South East Asia respectively. Both species have thick leaves and stout roots to reduce water loss and enjoy drying out well between waterings. At the bottom of the mesh Trichoglottis pusilla which comes from wetter cooler forests above 1000m in Java appreciates the extra moisture that comes from being within easy reach of smaller student waterers and the added shade from plants above. 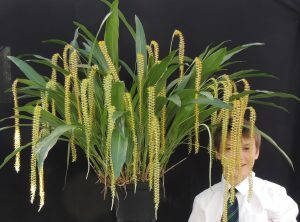 Dendrochilum species are another feature of our Warm Asia section. D. magnum and D. cobbianum both come from the near the equator in the Philippines, but are found above 1200m and so enjoy our ‘warm’ rather than hot. 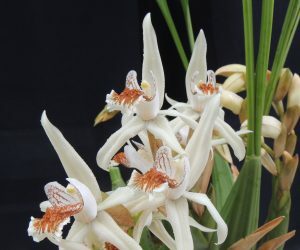 The genus Coelogyne also has a number of dramatic warm growing species. We are very fond of the large growing Coelogyne asperata and this is found through the warm forests of Malaysia to New Guinea but up to a maximum altitude of 2000m. We keep this species particularly well watered. 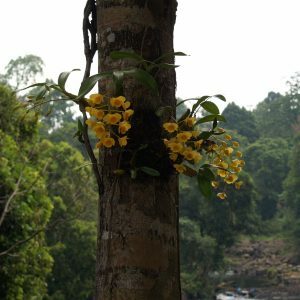 A large number of dendrobium species spend at least some of their time in our Warm Asia section. 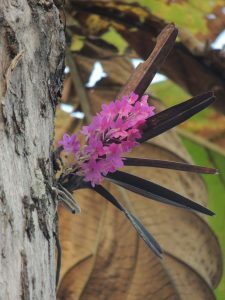 The Himalayan species Dendrobium aphyllum, thyrsiflorum and densiflorum all spend the winter in a cooler section (min 12C) while the equatorial species Dendrobium mohlianum, bracteosum, fairchildiae and panduryferum stay warm all year. A number of lowland Phalaenopsis species are rather too warm in their requirements to enjoy our conditions but as explained earlier Phalaenopsis mannii is right at home and we grow it pendulously from the side of a basket allowing it to develop in a similar way to the wonderful specimen we saw in the lowland forests of Assam. After reading your very in-depth and informative essay on growing warm Asian orchids I have spent the afternoon measuring the temperatures of my window sills and I am quite relieved to discover that my kitchen /diner window sills, away from the direct heat of the Rayburn are at 18C. 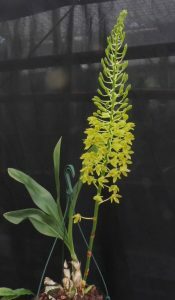 (They may get a little cooler at night) Edward has a Dendrochilum magnum on the kitchen window sill and I have a Dendrobium densiflorum on the diningroom one. We also have a Brassia-verrucosa and Edward’s Oncidium Twinkle on the kitchen window sill. Is 18C ok for these too? Excellent work – it is always good to know what conditions your plants are experiencing.